Humanity is rapidly becoming less the outcome of a natural process of development, and more and more the product of an organized educational plan. The average educated man possesses no real individuality. He is simply a manufactured article bearing the stamp of the maker. Year by year this fact is becoming more emphasized. 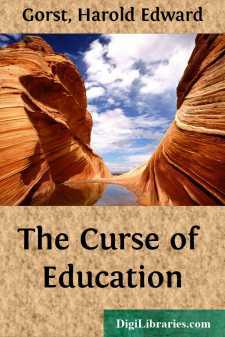 During the past century almost every civilized country applied itself feverishly to the invention of a national plan of education, with the result that the majority of mankind are compelled to swallow a uniform prescription of knowledge made up for them by the State. Now there is a great outcry that England is being left behind in this educational race. Other nations have got more exact systems. Where the British child is only stuffed with six pounds of facts, the German and French schools contrive to cram seven pounds into their pupils. Consequently, Germany and France are getting ahead of us, and unless we wish to be beaten in the international race, it is asserted that we must bring our own educational system up to the Continental standard. Before going more deeply into this vital question, it is just as well to consider what these education systems have really done for mankind. There is a proverb, as excellent as it is ancient, which says that the proof of the pudding is in the eating. No doubt learned theoretical treatises upon the scope and aim of educational methods are capital things in their way, but they tell us nothing of the effects of this systematic teaching and cramming upon the world at large. If we wish to ascertain them, we must turn to life itself, and judge by results. To begin with, the dearth of great men is so remarkable that it scarcely needs comment. People are constantly expressing the fear that the age of intellectual giants has passed away altogether. This is particularly obvious in political life. Since the days of Gladstone and Disraeli, Parliamentary debate has sunk to the most hopeless level of mediocrity. The traditions of men such as Pitt, Fox, Palmerston, Peel, and others, sound at the present day almost like ancient mythology. Yet the supposed benefits of education are not only now free to all, but have been compulsorily conferred upon most nations. Nevertheless, even Prussian pedagogues have never succeeded in producing another Bismarck; and France has ground away at her educational mill for generations with the result that the supply of Napoleons has distinctly diminished. Look at the methods by which our public service is recruited. Who are the men to whom the administration of all important departments of Government is entrusted, and how are they selected? They are simply individuals who have succeeded in obtaining most marks in public competitive examinations—that is to say, men whose brains have been more effectually stuffed with facts and mechanical knowledge than were the brains of their unsuccessful competitors.